«Межа» Петера Беб’яка, створена у копродукції Словаччини та України, тріумфувала на цьогорічній Словацькій кінопремії. Кримінальну драму було визнано найкращим словацьким фільмом 2017 року. Петер Беб’як отримав нагороду найкращому режисеру, а виконавець головної ролі Томаш Машталір – найкращому актору. Також «Межу» відзначили за найкращі монтаж (Marek Kráľovský), звукорежисуру (Viktor Krivosudský) та музику (Slavo Solovič). 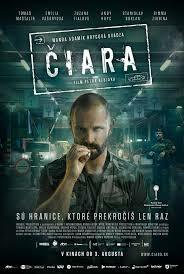 The Slovakian annual film awards, The Sun in a Net, which spotlight the most remarkable offerings in the domestic production landscape, belonged to The Line, a crime-drama by Peter Bebjak. Bebjak took home the Best Director Award at the Karlovy Vary International Film Festival, where the movie was unveiled as a world premiere, and was picked by the Slovak Film and Television Academy to represent the country at the Oscars in the Best Foreign-language Film category. After a resounding domestic success at the box office, The Line has now been named Best Film at The Sun in a Net ceremony. Not only did The Line win the top prize, but Bebjak was also lauded as Best Director, his collaborators Marek Kráľovský, Viktor Krivosudský and Slavo Solovič were crowned with the Best Editing, Best Sound and Best Music Awards, respectively, while lead actor Tomáš Maštalír was dubbed Best Actor. Among the other victors were the documentary A Hole in the Head by Robert Kirchhoff, which investigates the Roma holocaust, and Katarína Kerekesová, who produced and directed the series The Websters, which came out on top in the Best Animation category. Two domestic films that received considerable exposure on the international circuit and which both narrate a story from the perspective of a child – the Crystal Bear-winning coming-of-age drama Little Harbour by Iveta Grófová and the family drama Nina by Juraj Lehotský, screened at Toronto – were not overlooked. Little Harbour won Best Script, Best Cinematography and Best Art Direction, while Robert Roth received the Best Supporting Actor Award for his performance as the father in Nina. Katarína Štrbová Bieliková won the Best Costumes trophy for her work on Václav Kadrnka’s medieval road movie about the Children’s Crusade, Little Crusader, another high-grossing domestic film, Kidnapping, netted the Best Make-up Award, while Zuzana Kronerová and Judit Bárdos were lauded for their performances: Kronerová as the lead in Ice Mother and Bárdos as a supporting actress in György Kristóf’s ambitious feature debut, Out.